Chef Aiden Byrne has returned to Tower 12 with the launch of restaurant MCR. Open from Friday 7 December, restaurant MCR is focused on the quality of its food and the warmth of its welcome. Aiden and his team will deliver an unsurpassed dining experience with the option of 6 or 12 course tasting menus that showcase the very best of the reinvented classic dishes he has become synonymous with. restaurant MCR has re-opened in quick-time, such has been the demand from diners in Aiden’s return. The chef is determined to retain the warmth and welcome that the former venue was known for in the new venture, ensuring that the guest is at the heart of the restaurant. 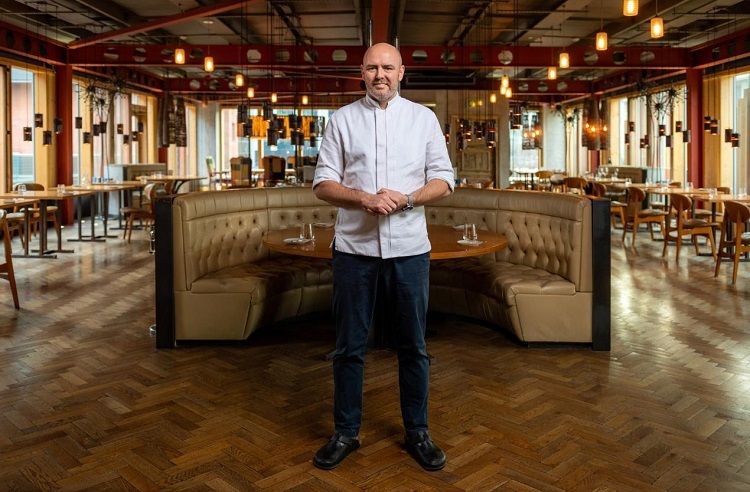 Regarded as a Manchester institution, with restaurant MCR, Aiden wants to reinvent the experience for the guests with a more personal touch in familiar surroundings. His menu will draw on his career, seeing traditional flavour combinations, crafted into something new and surprising in the 12 course tasting menu. “We are so happy to be be able to make this happen before Christmas, but we just had to make it work. So many people made contact when the news broke last week, while it’s been a crazy week turning this around. It means that we can bring back the tasting menu and get back to basics. Doing what I love, sending food and watching as our customers connect with the food. The menu will see Aiden craft a signature tasting menu of classic flavour combinations presented in a modern and accessible way, with the choice of 6 or 12 courses offering the best way to experience the full breadth of his extraordinary skill and exceptional flavour combinations. There will also be an express lunch of 3 or 6 courses available but the main objective for the restaurant is to give guests time to enjoy their meal and create a comfortable and welcoming atmosphere where old friends and new are treated like loyal regulars.